Be Nice(r) « Eric Anthony Grollman, Ph.D.
Sure, the internet has a lot of “trolls.” But, it seems bullying on the internet is not limited to children and adolescent, and not even those who are not as “enlightened” as academics. Since one of the common meanings of the word “collegial” is to be supportive and friendly, I have always assumed I would find those characteristics implied in the definition of “colleague.” A quick web search for dictionary-provided definitions of both terms provided no reference to support or friendliness; the former has to do with sharing responsibilities. Even by definition one cannot expect one’s colleagues to be friendly and supportive! As it turns out, being a jerk is thought by some to be a requirement for excelling in academia. Jerks are not necessarily liked, but they may garner more respect as a competent and competitive scholar. And, at the very heart of academia lies having to be better than someone else: to be the one of hundreds of applicants to get the tenure-track job; to demonstrate that prior research is limited, and you have something better; to show your course evaluations are better than the department’s average; to convey you have a breakthrough in mind that can only occur if you are awarded the grant. And, of course, (some) academics seem obsessed with prestige and status, ranging from the ranking of particular programs, to the privileging of “R1” over everything else, to the quantified “impact factor” of peer-reviewed journals. So, it is probably fair to put to rest the possibility that anyone has come to academia to make friends. So, I note the academic culture and institutional reward structures that breed meanness. And, our work is inherently critical; we focus on seeing limitations, pitfalls, and weaknesses. But, academics sometimes take that beyond their scholarship and teaching, reaching inappropriate and unnecessarily levels of negativity in our interactions with others. We do not have to be mean. Criticisms need not be hostile, and if it has to do with one’s work, it is inappropriate to even imply weaknesses of one’s character, values, or work ethic. Practically speaking, nastiness is bad for our departments, universities, and individual careers. I do not mean to imply that we will all be (or should be) friends. But, why not be civil? We all go through the emotional roller coasters of journal and grant rejections, stress about tenure and promotion, and those few negative students evaluations we focus while ignoring the positive majority. May I ask that we at least avoid making matters worse for our colleagues? Compliments can be an unexpected delight — people noticing your name tag or sending an email out of the blue (especially when you’re not chairing a hiring committee). And the more obscure and left-field the compliment, the better. Kind words about a newsletter piece, a talk for a community organization, or a small contribution to a book that sold 5 copies are especially appreciated. Looking over the past year, did you find something charming or true in one piece you read? Or, perhaps, in a piece of a piece you read? If so, the author would like to hear about it. Another manifestation of the status-obessessed culture of academia is our love of awards. There are so many awards out there. As if getting a paper through peer-review is not enough, we also need our colleagues to shower us with praise about how great our work is. I understand it — I like that praise, too. But, these awards that come from our colleagues through institutions and organizations do not express appreciation and thanks. In fact, I cannot think of a single institutionalized way in which we do so for our colleagues. So, I strongly encourage doing so on your own, particularly in the form of sending small thank you cards (the old-fashioned way, not by email). This is for the stuff that good academics should do (in my opinion), including thanking interviewers for jobs and former advisers. But, I have also thanked people who have simply been a supportive in some way, just as a friend or teacher, or giving passing advice, or collaborating on some (extracurricular) project. Many express surprise, including a few who did not realize how important they are, or how significant the supportive act was to me. As academics, we are constantly bombarded with evaluations of our failures, but there is no systematic way of being reminded of the ways we are appreciated. Dr. Uggen is right that a small gem of praise or appreciation can be particularly meaningful as we otherwise drown in criticism. Academics are awkward. I recall reading Playing the Game: The Streetsmart Guide to Graduate School before I started graduate school, and nervously laughing at the promise that you finish graduate school with a PhD, but with less common sense and social skills. Oh, how true, how true. So, I give my fellow academics a bit of leeway on interacting with other hyoo-muh-ns (humans, in a weird alien/robotic voice). But, I have noticed that many academics do not push themselves to be something other than an academic with colleagues. Some of us have a tendency to hide behind “shop talk” — either administrative tasks or teaching matters, or deeply discussing methods and research — to avoid having to connect in meaningful ways. I have tried on many occasions with advisers, colleagues, and acquaintances, but find that I am given a curt “I’m fine” (to “how are you?”) to end such small talk. Of course, I understand that friendship is not a given with coworkers. But, we do not seem to put much effort into finding out whether we have something other than being academics in common. I find connections as whole people more meaningful, and more likely, than strictly as academics. I became more interested in my grad school advisers when I realized they had lives outside of their offices. I admire a number of colleagues who are unapologetic in their activist-leanings, pursuing academic careers to make the world a better place. Interactions with colleagues I do not know as well are more interesting and sustained when they are driven by a motivation to connect, not simply the calculated efforts of making professional networks. Apologize when you are wrong or have hurt someone. Respect differences. Understand that your perspective may be different than others — but no one is better than the other. 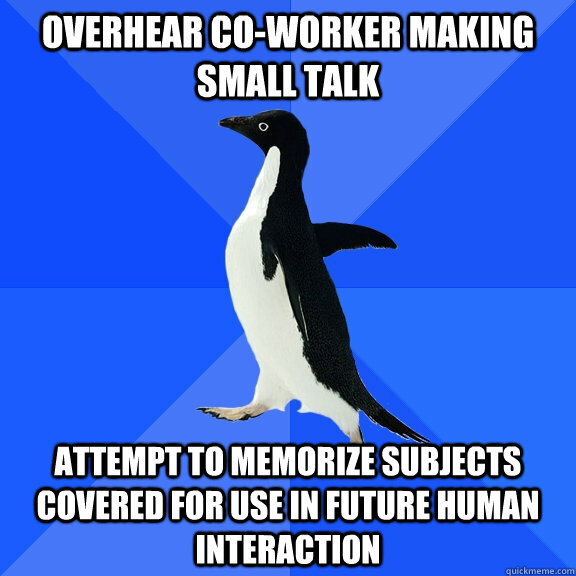 Funny, but it surprising how many of my colleagues fail to demonstrate good manners. Please do better. UPDATE (11/28/13, 6:21PM): One of the aforementioned commenters’ name and comment have been removed from this post per their request. By Dr. Eric Anthony Grollman in graduate school on September 23, 2013 . Given some of the loaded meanings of “be nice,” especially for women, the “be kind(er)” of the leading image might be a preferred way to couch this, but the point is well taken. Thank you for saying it. Ah, you have an excellent point. That, and “smile” — things to which I have not been subjected thanks to male privilege. 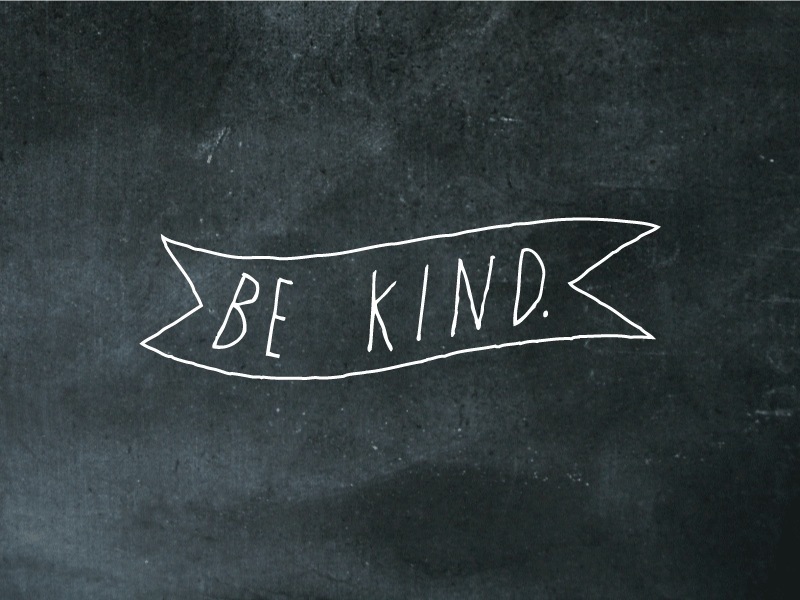 Rather than (or in addition to) be nice(r) or kind(er), why not simply be attentive? What do I mean? You enjoy a journal article–write the author(s) and tell them.You want to know more about your colleagues–read one of their manuscripts and talk to them about their work. You hear your students raving about a colleague’s class–tell them and ask them about their teaching. So much of our work including the highs and lows happen in isolation and we often complain about this and wonder why others aren’t attending to us. But, are we really engaging others? Thus, be attentive, nice, and kind! Yes! Thank you, Jordan. I actually just heard a great term for this — “benign negligence.” (This was used to describe the lack of support new faculty feel.) Given the emphasis on individualism, it’s hard for people to take their heads out of their own lives to check in on others. Maybe we need some way to make this a habit, just like being critical is regularly practiced as researchers. Also, be brave. It takes audacity to say something unpopular. It’s easy to tear people down–that’s what those commenters did for several days after Inside Higher Ed published my essay. Then, slowly, other folks who understood my perspective started to voice their opinions, too. That took courage for those poor, anonymous commenters. Thank you for being kind, nice and brave enough to put civility and collegiality first. I wonder if this is a “gift” of my physical disability. I attended the ASA conference in NYC in a wheelchair (mobility scooter for those who know the difference). I just completed my MA and am not sure I want/need the PhD (Reason #1: I’m dyslexic and have a growing physical anxiety response to the idea of grading a stack of 100 intro papers, which seems to rule out teaching or even being a TA. Reason #2: my physical disability limits my stamina, I cannot relocate for a PhD program or job afterwards, and the nearest program in my specialty is an hour drive each way. PhD isn’t worth the very real risk of dying in a fatigue-induced car accident). At the conference, I had several meaningful, real-person to real-person interactions with various individuals (several of them old enough to be my parent, if not my grandparent). It was lovely, they were all very kind. I do wonder if that was triggered by the intersectionality of me being young, female, in a wheelchair, and having my children appear with some regularity (I have 4 and my youngest is still breastfeeding, so my husband brought him to me when needed). If one or two of those variables were different, would they have let their guards down to be human with me as much? I *hope* the answer is yes, but I do not have a high degree of certainty. Wow, that is tough. I appreciate that you are being honest with yourself — letting your and your families’ needs weigh into your professional decisions. I’m glad others were open to you at ASA, though! That hasn’t *always* been my experience.